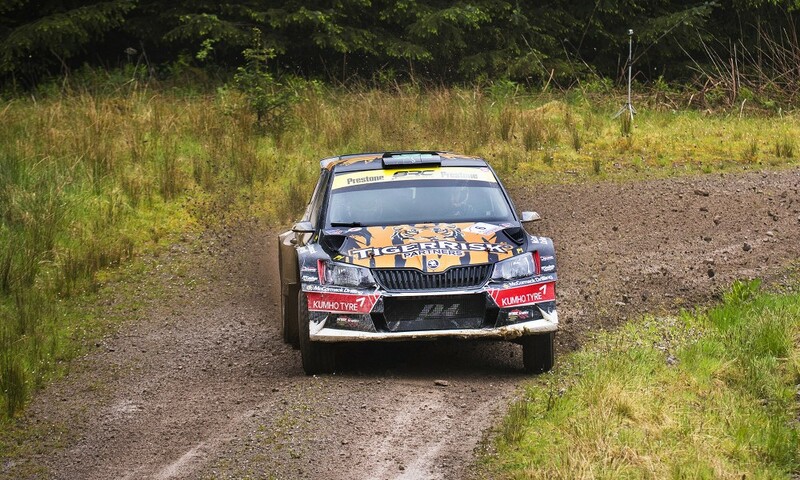 Coming off the back of a fine podium finish in the Pirelli Rally and a win at the Donegal Forestry, the TigerRisk Rally camp claimed an excellent 3rd overall at the Scottish Rally, round 3 of the British Rally Championship! As the 2017 season progresses Marty McCormack and David Moynihan are really starting to gel with their new Škoda Fabia R5! The stage times and results have been getting better and better. 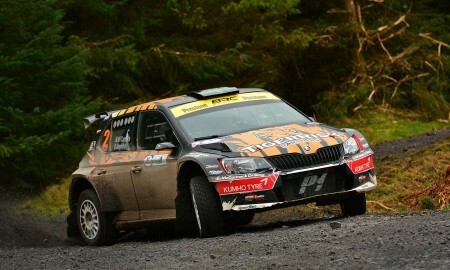 Confidence was high heading into the Scottish Rally based in Dumfries. After a string of top results on recent events, Marty and David hoped to fight at the front of the event and they didn’t disappoint! The rally got underway on Friday night with two runs over the 8 mile ‘Mount Joe’ test the first run through at dusk followed by the second run in the dark. A real tricky opener to the event. Saturday morning and 8 gruelling tests lay ahead, the first of which Marty knew he had to push on “We have to keep the pace up this morning to keep with the boys in the front” and that is just what he did. The TigerRisk car secured its fourth-place over the opening two tests of the day firmly cementing them in contention for the podium. 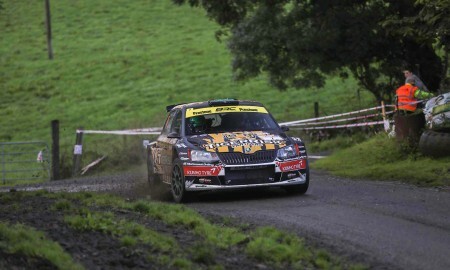 Back in service, the McGeehan Motorsport Team bolted a set of Speedline rims and 4 new Kumho tyres onto the car for another attack at the Scottish stages. Through stages five and six Marty hunted down third place man, Osian Pryce, closing the gap to four and a half seconds with four stages to go. But he would have to keep an eye on his mirrors as Keith Cronin was nipping at his heels. Running wide on a corner on stage seven allowed Cronin to slip ahead. Cronin would maintain a slim advantage into the next service with Marty commenting “ Keith is just ahead of us now but there is nothing in it, we will go on a big push on the last two (stages) to try and regain the place!” The battle for the last podium spot was well and truly on! 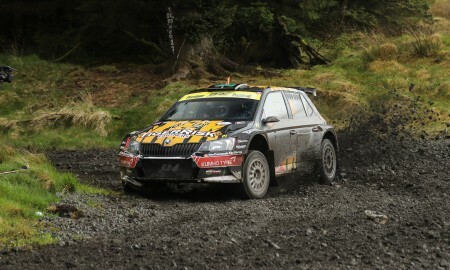 Cronin went on the attack on stage 9 pulling a further 1.9 seconds out of Marty leaving the gap at 5.7 seconds. The TigerRisk Team would have to dig deep over the final 8-mile stage to reel in Cronin. 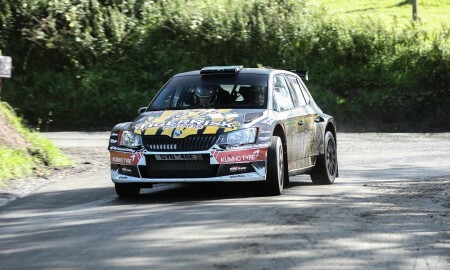 The Škoda Fabia R5 blasted into the test and the determination was palpable to see. Marty threaded the car through the stage at lightning pace to cross the finish line in a time of 7 minutes 12.6 seconds. The average speed through the stage was a hard to believe 68mph and as Cronin crossed the line it was evident they had done enough. 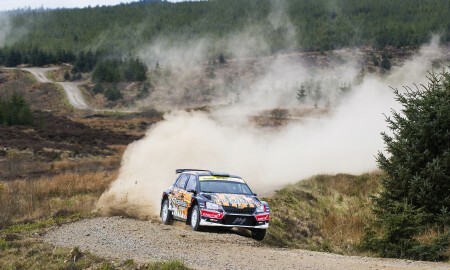 A staggering 13.7 quicker was enough to vault them ahead of Cronin in the standings and when rally leader Fredrick Åhlin failed to finish the stage they inherited another place to put them on the podium in Dumfries. With Marty now holding 4th place in the British Rally Championship standings, Rally Ypres which takes place from the 22nd to the 23rd of June will be one to capitalise on to move closer towards the top of the championship. Keep an eye on this site for further updates on Marty’s BRC bid, as well as on Twitter @martymccormack and on Facebook at www.facebook.com/marty.mccormack1. Marty is competing this season with the support of Tiger Risk Partners and P. McCormack and Sons Ltd.